I use to write, well, dabble a little when I was younger and then there was this point where I was harassed online, so I tended to stay off the internet and write more than anything else. Before I knew it, my first book was done, so I said, “Why not” and published it. It was seriously something that I never thought I would have been able to do. They just come to me, honestly. I think of the story plot and gender and I just write. It comes so naturally and I know that sounds like the recipe for a bad book, but it’s worked so far. My friends and family inspire me. I see people online all the time, posting about their success and their lives, seeing that they have both and that’s what I want. I want to be able to do both and both parts inspire me, pushing me onwards. I watch television shows! The newest one I’m hooked on is Supernatural. I might occasionally take something from a show and twist it up a LOT and use that for inspiration. I love to write Fantasy, something about making up my own world with my own rules to escape this reality that really helps me push past my doubts, but I’m trying to expand to Paranormal and Horror with an idea in each genre being drawn up. Wow, I have so many. First, obviously, I have my usual famous authors like J.K. Rowling, Stephen King, George R.R. Martin and many others, but I also have my indie favorites like Cameo Renee, Tabitha Vargo, Kate Marie Robbins, Heather Kirchhoff, Natasha Vahora (who should inspire younger aspiring authors), and wow, I could continue that list and it would be longer than my favorite “famous” authors! I can’t really say. I know my first book was published February 2013 and that one took a few months to write, but I’ve been writing for longer than that, drawing out story ideas and much more whenever I could. The Arrival of Dawn is about a young woman who is sacrificed to these alien-like beings who are at war – light versus dark. She’s told that she is the reincarnation of their deceased queen and has to end the war, but she’s unsure. It’s book one. Lost in Wonderland is obviously a twist on Alice in Wonderland. Wonderland in this book is quite darker than the actual wonderland we know. When Alice returns from Wonderland, no one believed her story, so she was locked in an asylum, being questioned, but then things start going wrong there too (co-authored with Mags Knoll). Finding Hope is a short story about the effects of bullying on a young woman, causing doubt and insecurity in her mind. Wow, I have a few works in the making. First is the second book to Worlds Apart, titled Ready for War. When Subject 1974 wakes up, she has no recollection of herself, not even her name. When led to termination, she’s actually saved by a female stranger and together, they try to find out why the President is so set on getting this girl returned to him (co-authored with Morgan Middleton). Next is a novella for the Lost Tear Chronicles (Worlds Apart series), titled Hanna. 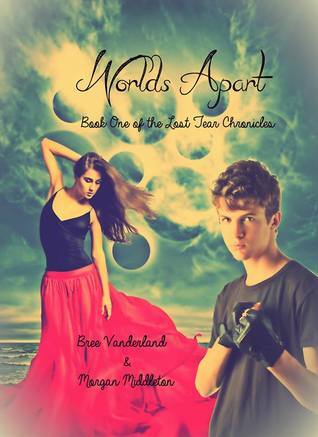 It’s about one of the characters in Worlds Apart and her life before Worlds Apart (co-authored with Morgan Middleton). Lastly, there is Dark Crown, which is my newest standalone novel that will be signed with Titan InKorp. It’s about another Fantasy land (obviously) and this seventeen year old female, Emmaline, who wakes up thinking it will just be a bad day. Instead, she’s kidnapped and taken to the land of Caymos where she’s told she’s the princess and daughter to the Dark Elf Queen, Angelicka (who isn’t an elf, but won the crown with magic). With a war going on, Emmaline must not only choose a side, but fight for it while battling emotions for her newest friend and protector, Vesryn. Thank you Heather for the interview and to Girl Who Reads for posting this! Connect with Bree on Facebook and Goodreads. Heather lives in a small town in Missouri. She became a bookworm back in sixth grade when her teacher suggested the Phantom Stallion series by Terri Farley and instantly fell in love. She loves reading paranormal stories, plus some love ones here and there. Writing is her passion-it helps her escape the world for a while, as well as reading-she doesn’t know what she’d do without it. She just loves it. When she isn’t writing, Heather is doing odd jobs, reading, taking walks, or spending time with her boyfriend and animals/family. Richelle Mead, Alyson Noel, and Stephenie Meyer inspired her to write. Connect with Heather on Facebook and Twitter. Girl Who Reads is an Amazon advertising affiliate; a small fee is earned when purchases are made at Amazon through the link above. The views, opinions, and beliefs expressed by guests are their own and do not necessarily reflect those of Girl Who Reads.